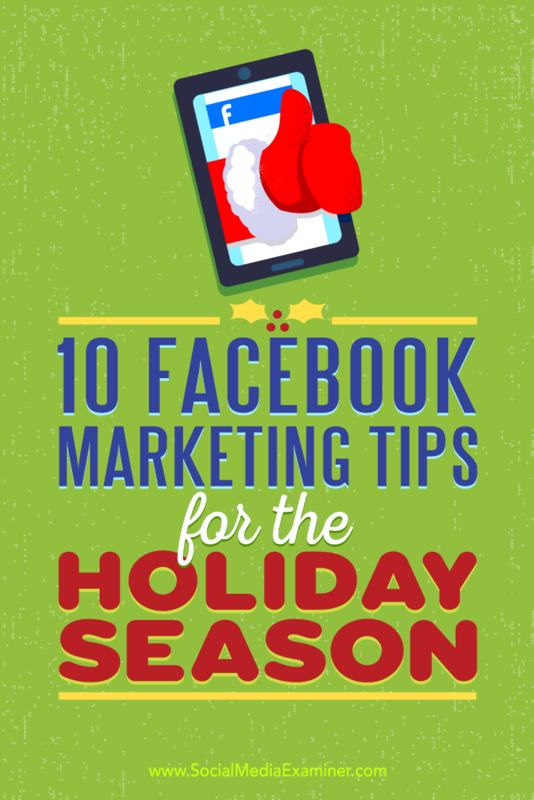 Is Facebook part of your holiday marketing plan? Are you looking for tips to improve your holiday campaign? In this article, you’ll discover 10 Facebook tips to widen your visibility and reach during the holiday season. 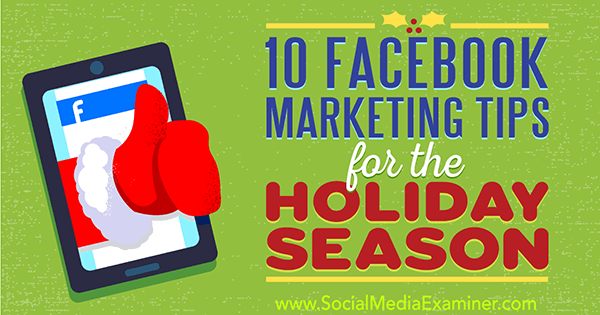 10 Facebook Marketing Tips for the Holiday Season by Mari Smith on Social Media Examiner. Before you utilize the power of Facebook, take the time to plan your promos and content. Looking to increase holiday sales? Make sure you know the key dates. Note the shopping holidays following Thanksgiving: Black Friday, Small Business Saturday, and Cyber Monday, as well as Christmas, Chanukah, and other celebrations. Create a word document or spreadsheet, or use a project management tool to keep track of what holidays you want to cover on social media. To really stand out, be the first in your industry to start posting. For example, ecommerce site Nanigans is at the top of my mind, since they were one of the first I saw post this season. 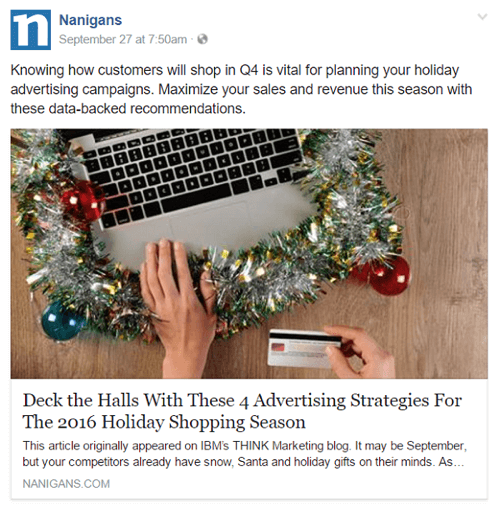 Nanigans is one of the first to post regarding the season, making the post more memorable. Once you decide which holidays your company will celebrate and highlight with your content, work backward to ensure timely, relevant content is created, tested, and scheduled. When planning your holiday posts, keep in mind that Facebook is a visual platform. Use videos, animated GIFs, and images to grab attention. For example, My Baking Addiction used this image of crumbly mini cherry cheesecakes to stand out in the news feed. It’s a bright visual with an interesting perspective that received more than 4,000 reactions and over 600 shares. In fact, nearly all of their posts are images and videos that make your mouth water. My Baking Addiction used a unique visual to make their holiday post stand out. Use the end of the year as a time for your fans to get to know your business and the people behind it. For instance, the Arlington Club, a restaurant in New York City, highlighted the backstory of Executive Chef Frank Cervantes. 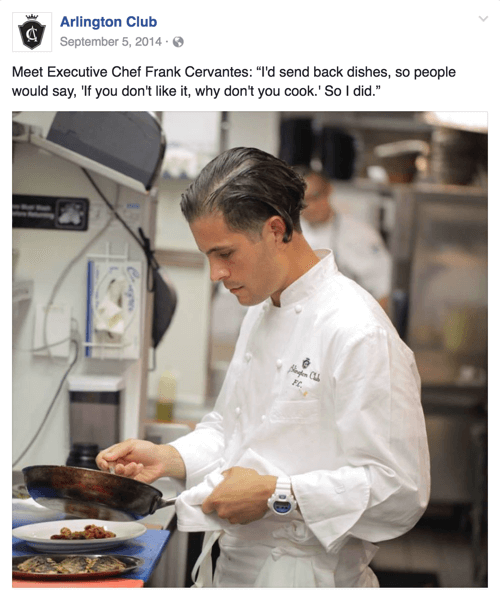 This image post featured a photo of the chef and a quote explaining what started him on this career path. Arlington Club uses the end of the year to introduce the people behind the company. Invite people into your business’s world. Take the opportunity to share a milestone with your audience, do a series of posts showcasing your employees, or both. 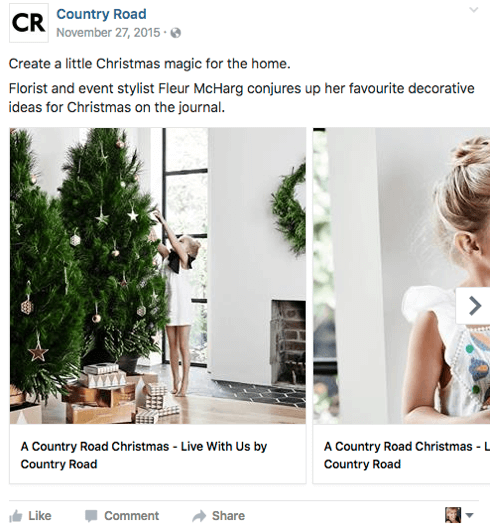 Australian fashion retailer Country Road shared its brand story in a visually rich Facebook ad campaign to promote its Holiday 2015 campaign. The campaign proved to be almost five times more effective at driving in-store sales than online sales. Country Road wanted to position itself as the store for holiday gifting to maximize Christmastime sales across its women’s, men’s, children’s, and home ranges. Country Road tells its brand story as part of its Holiday 2015 campaign. There’s a reason Facebook added reactions (love, laugh, wow, cry, and angry) to the Like button. People want to express their emotions when a story evokes different feelings. Your business content has to compete with posts from your audience’s friends and family. 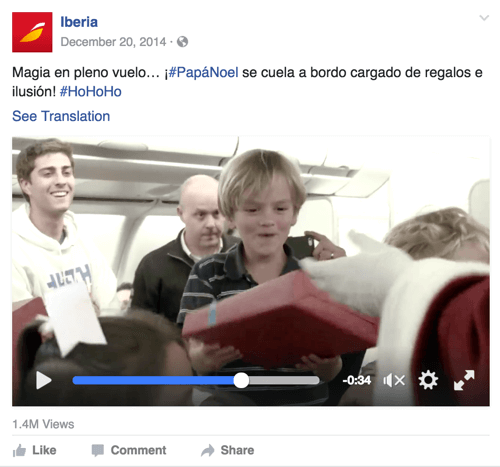 Iberia Airlines created an emotional video ad series featuring Santa Claus handing out presents to families during a flight. The company wanted to develop an internationally engaged community, on the move, reuniting with friends and families scattered across the globe to celebrate with loved ones. The video campaign garnered 4 million views and a reach of 46 million. This video campaign by Iberia Airlines connects through the emotion of the holidays. The goal of any post is to get a lot of engagement since engagement (especially shares) leads to even more comments, likes, and shares. Be intentional with the content you create. Fans engaged well with this top candy recipes post by Taste of Home. Taste of Home knows their audience. 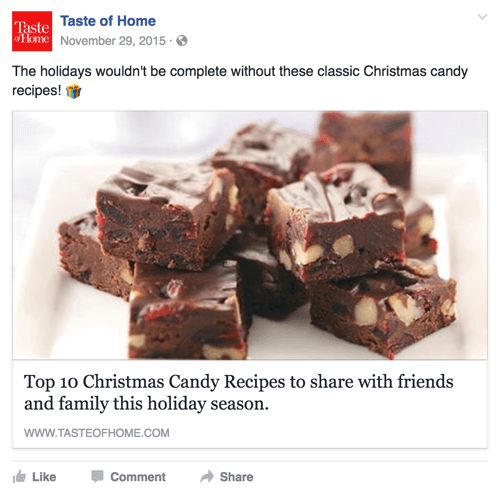 Their Top Christmas Candy Recipes post last year exceeded 9,500 shares. Reactions were close to 10,000. Mixing an entertaining element with an emotional connection is a delicious recipe for getting more shares. This will bring even more attention to your business. Once you have your key dates and content in mind, use Facebook tools to amplify your message and reach more people. With the growing popularity of Facebook’s Live video broadcast feature, now you can easily host virtual events such as a virtual office party or customer appreciation party via Facebook Live. Create a Facebook event on your business page and invite your friends and fans. Facebook recently started rolling out a new feature that allows you to pre-announce your Live video event and garner an audience ahead of time. 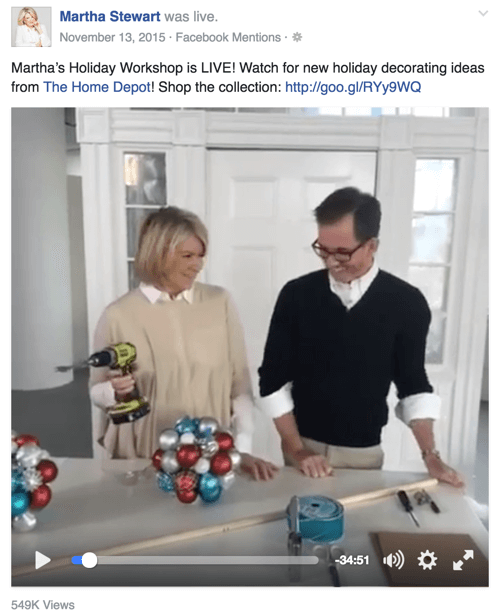 Lifestyle guru Martha Stewart hosted a fun live Holiday Workshop with decorating ideas from The Home Depot using Facebook Live video on her fan page. Martha Stewart shares decorating ideas in this Facebook Live workshop for the holidays. Of course, you don’t have to get as fancy as Martha. A simple and sincere Holiday greeting, like Michele Ruiz did here via Facebook Live, can draw in your fans. Facebook is investing heavily in garnering more awareness and users for its Live video feature, including launching an international ad campaign on television, buses, and billboards. Facebook is also paying celebrities and media outlets to use Live video. So now is the perfect time for you to jump into the world of Live video on Facebook. 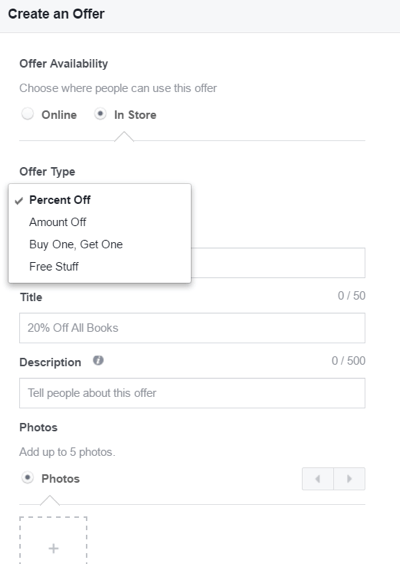 Facebook enables you to create an online or in-store offer to share on your business page. Click Offer in your status bar. Next, choose Online or In Store, and then select an option from the Offer Type list, which can be Percent Off; Amount Off; Buy One, Get One; or Free Stuff. The settings available when creating a Facebook offer. For an online offer, include the URL. Then enter the details of your deal. Add a title (up to 50 characters), description (up to 500 characters), and up to five photos. You’ll see a preview for desktop or mobile view as you add information. Facebook offers are an easy way to share special bundles, discounts, and incentives with your audience all year long. However, it’s even more relevant during the holidays. Most people are on mobile so be sure your ads, posts, and any related landing pages are optimized for it. 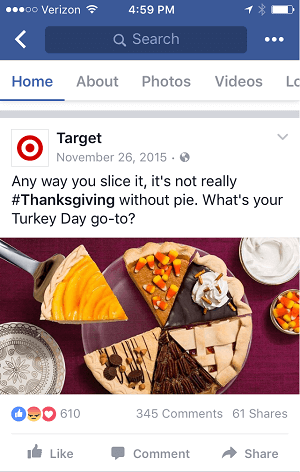 This fun image post from Target with different Thanksgiving pie options looks great in both the mobile and desktop feeds. It’s a cute post that brings humor to most people’s favorite Turkey Day dessert. This Thanksgiving post by Target shows well on both desktop and mobile feeds. Mobile ads are important for targeting people shopping on the go. However, they’re also valuable for directing people to your brick-and-mortar business. Use the Local Awareness feature to target audiences when they’re near your business. You can even give them directions to your location right on their phones. A relatively new type of audience that you can reach with Facebook ads is called engagement custom audiences. These are people who have already shown an interest in you by watching your videos, interacting with one of your other ads, or sharing your website links on Facebook. You can draw engagement custom audiences in further by placing additional paid content in their feeds. 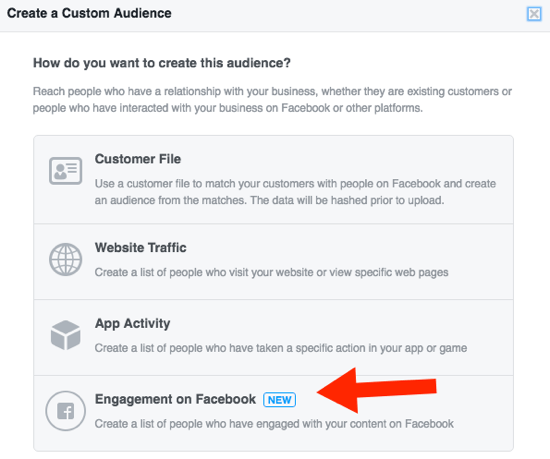 Set a custom Facebook audience based on engagement. Video Views: Create variations of audiences comprised of people who have already viewed one of your videos, whether the video was organic or promoted. Views are at least: 3 seconds, 10 seconds, 25%, 50%, 75%, and 95%. The longer your video, the less likely people will have watched to the end, so it’s better to select 25%, for example. Dennis Yu gets even more advanced and granular by targeting people who have watched 3 seconds but not at least 10 seconds; or watched video A and B but not C. You can target any type of ad to these audiences. Lead Ads: Someone may have looked at your lead ad but didn’t complete the form (enter their email address). Target people who’ve interacted with your lead ad since they’re already familiar with you and have cared enough to click once. 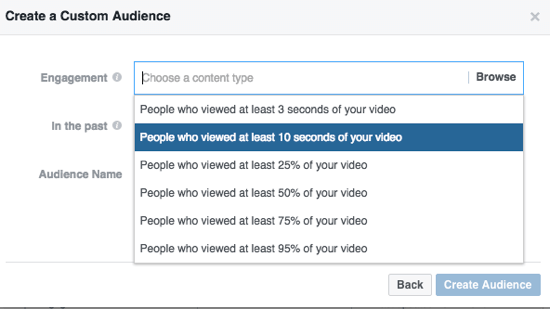 Narrow your custom Facebook audience by percentage of video watched. Canvas Ads: Similar to lead ads, target people who have interacted with your canvas ad but haven’t taken any action yet. Link Sharing: Link targeting is brand new and available to only a limited number of advertisers so far. You’ll be able to create an audience based on people who shared your content on Facebook. If someone has gone to the trouble of sharing your content, they’re likely interested in learning more about what you have to offer. It can take many touches for a prospective customer to get familiar enough with you to take the next step. People don’t always make a purchase decision on the first visit, so remind them who you are through retargeting. Your ad performance and conversion will be much more effective when you use the Facebook pixel and retarget potential customers who already visited your website. In fact, Facebook is now beginning to give priority to ads that are connected to a properly installed Facebook pixel, even including boosted posts. 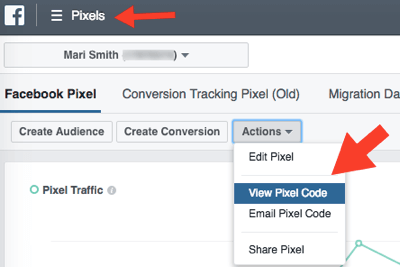 Select View Pixel Code from the Actions menu to view your Facebook Pixel code. First, ensure you have the Facebook pixel installed on your website. Go to the Pixels section in Ads Manager and select View Pixel Code from the Actions menu. Copy and paste the code to your website. Also, use the Facebook Pixel Helper browser extension to double-check that the pixel is correctly installed and firing properly. The icon on your browser should light up. 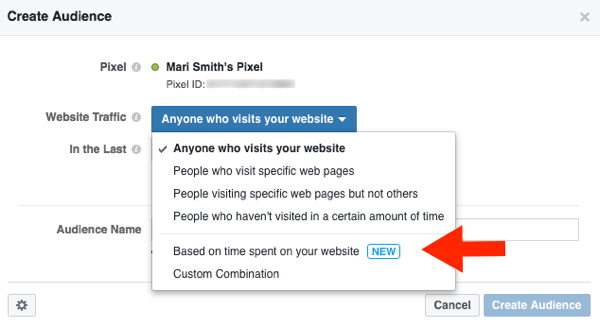 Now you can go into your Ads Manager and create a variety of website custom audiences based on time on site. The choices are most active users: top 5%, top 10%, and top 25%. Create a custom Facebook audience based on website visit data. Someone who spends 2 minutes on your site is a hotter prospect than someone who visited for just 10 seconds. This is a wonderful new feature that Facebook added earlier this year. The period leading up to the holidays is the largest consumer spending time of the year. People buy gifts for others and themselves. Since they don’t always know what they’re looking for, help them. What do you think? 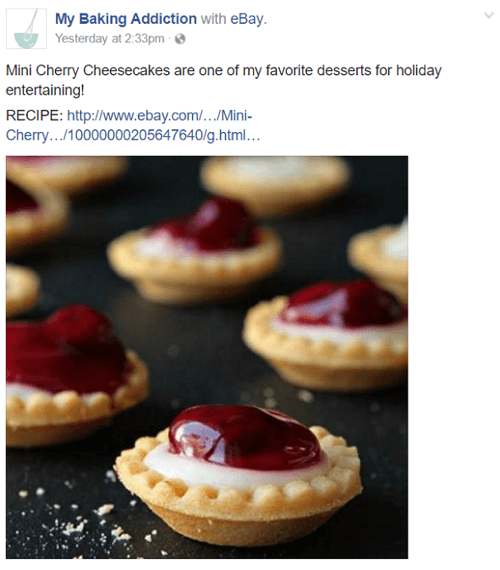 How do you use Facebook for your holiday promotions? What are some of your success stories? Please share your thoughts in the comments.